There are 6,000 to 7,000 rare diseases affecting a patient population of around 350 million. Government policies and incentives have led big pharma companies to set its sights on developing orphan drugs. 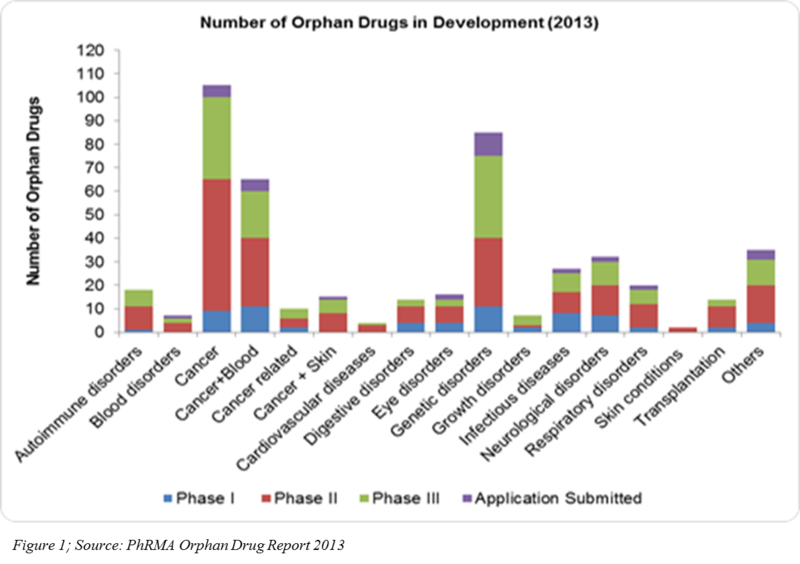 There are around 450 orphan drugs in development encompassing different therapeutic areas. Though the Phase 3 costs of conducting orphan drug development are smaller when compared to non-orphan drugs, rare disease clinical trials encounter many challenges, not only in terms of patient recruitment, but also retention. This paper discusses technologies or methods that can be incorporated in patient recruitment that will provide successful rare disease patient enrollment and retention. Definitions of rare diseases vary according to the country. In the U.S., rare diseases are considered “rare” when a chronic and enervating condition afflicts fewer than 200,000 people combined, and in the EU, when it affects fewer than approximately 250,000 people. Nevertheless, 6,000 to 7,000 different rare diseases affect an enormous population of 350 million (In the U.S. — approximately 10 percent of the total population, and in the EU — approximately 6 to 8 percent of total population) and around 250 new rare diseases originate every year (1, 2). Fewer than 5 percent of rare diseases have treatment options, and around 80 percent of the rare diseases are caused by gene malfunction. The U.S. Orphan Drug Act in 1983, coupled with other regulations in different parts of the world, has encouraged pharma companies to venture into rare diseases drug development. It has proved to be myth that only the drugs developed for high prevalence diseases contribute the most to pharmaceutical sales. According to the 2013 EvaluatePharma report, orphan drug sales for the year 2012 to 2018 will grow at a CAGR of 7.4 percent — almost double that of prescription drug sales. Pharmaceutical companies in 2011 had 1,795 rare diseases development projects (U.S.), and 450 orphan drugs are currently in development in different phases of clinical trials (Figure 1). 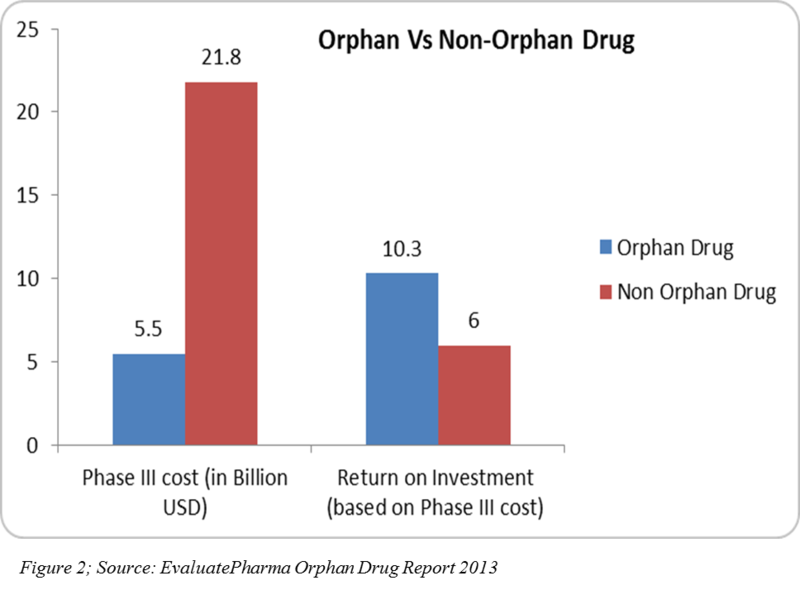 R&D spend on orphan drugs is half that of non-orphan drugs. After U.S. tax credits, R&D spend can be even a quarter of that spent of non-orphan drugs, and the return on investment on orphan drug sales are higher(4)(Figure 2). In 2013, 31 orphan drugs were approved — the highest number since 1983 after the U.S. Orphan Drug Act (5). Originally, there were more biotech companies in the rare disease research space. However, once Big Pharma realized the returns it would gain from rare disease drugs, more companies began to jump into the rare disease space. Due to internal pipeline drugs going off-patent, pharma companies started acquiring the rare disease-focused drug developers and began showing interest in establishing their own drug development units for targeting rare diseases. Moreover, as more orphan drugs become applicable to multiple indications, market exclusivity is extended. These label extensions, along with patents, will keep orphan drugs from facing generics competition early. Though the Phase 3 cost of conducting an orphan drug trial can be lower when compared to the Phase 3 cost of a non-orphan drug due to smaller sample sizes, there are various challenges in the multifaceted clinical trial conduct. One of these challenges is patient recruitment and retention. About 30 percent of the Phase 3 studies fail due to enrolment challenges (10).The paucity and scattered rare disease patient population across the globe, along with the fact that more than 50 percent of the rare diseases affect the pediatric population, are regarded as the major factors that impede faster patient recruitment. For a clinical trial enrolling 20 to 100 patients for a Phase 3 trial, every single patient’s participation is monumental in assessing the drug’s effects; the more patients, the more evidence-based data for regulatory authorities, as well as for payers to use to determine pricing and reimbursement. The traditional methods of patient recruitment should be slightly altered and should employ a more patient centric approach. Patient recruitment and site activation should depend upon the prevalence of that particular rare disease instead of launching sites across multiple locations and waiting for patients to enroll. This will foster cost savings, as well as keep the timeline free of delay (6). In a traditional model, the patients visiting the sites face more inconvenience because they may have to travel long distances. The sponsors conducting the study should spend more money on lodging and travelling, not only for the patients, but also for their caretakers to prevent patient drop-out rate. This is a burden on the overall study budget. In-home clinical trial support was brought to practice in clinical trials a decade ago. This model takes into account the personal preferences of the patients, their disease symptoms, and their difficulties in travelling long distance to sites while designing a clinical trial protocol (7). In the in-home clinical trial support program, CROs, for example, Orphan Reach, Symphony Clinical Research (Figure 3), have a network of hospitals and trained nurses or clinicians on GCP in different parts of the world. As per the protocol, the nurses travel to the patient’s home and administer drug infusions, conduct blood draws, PK sampling, or clinical tests required for the study. This approach is beneficial in pediatric or neonatal clinical trials where the procedures can be performed in home or school according to the patient’s convenience. This results in fewer visits and less travel for the rare disease patients, consequently saving the travel and lodging costs incurred by the sponsors. Traditional method: The large CROs/labs engage with their partner referral labs for performing the central lab services. These large CROs/labs select their external referral lab partner through multiple assessments and conduct clinical trials at specific sites and support sample logistics from sites to the referral labs. These methods are not conducive for rare disease clinical trials. Alternate method: By including the patient home support model, sponsors (Pharma/Bio-pharma/CRO) engage with a specialized rare disease CRO for conducting the patient home support services and collect the samples directly from the patients via nurses and deliver it to nearby local referral labs. The partner referral labs perform specific tests under regulatory compliance, protocol-specific as instructed by the large CROs/labs, and deliver test results to the labs for further processing (Figure 4). Patient registries are created through collaboration between different nations like the U.S. (NORD), Europe (EURORDIS), and Canada (CORD). These patient registries are web-based data repositories that contain patient’s treatment-related health information encompassing as many geographies as possible, and biological samples data and their corresponding bio-banks with a Global Unique Identifier (GUID) to facilitate the tracking of patient information. These registries are managed by either public, private for-profit, or not-for-profit organizations, and they further aid the various rare disease patient cohorts in building support communities (Figure 5a, 5b). These communities can share information regarding the clinical trials in which patients with debilitating disorders can be benefitted. Patients afflicted with rare diseases, Pharma/Biotech companies developing drugs, Contract Research Organizations, and Principal Investigators. 1.) Enable researchers to conduct epidemiological studies 2.) 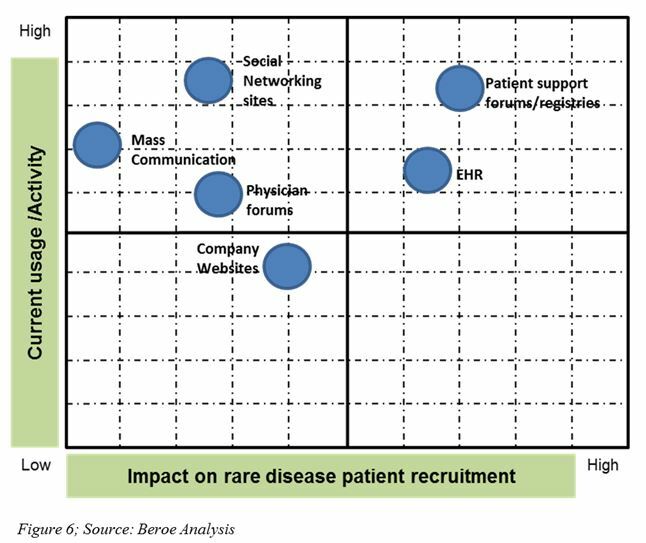 Accelerate patient recruitment for rare diseases 3.) Prevent enrolment delays at sites 4.) Enable better site planning at the beginning of the trial 5.) Real-time post-marketing surveillance studies on orphan drugs and also off-label drugs used on rare indications (8). However, to safeguard patient privacy information, only de-identified data is present in the main repository; contact information to recruit patients can be collected from the home registry that contributed to the main repository. For example, NIH/NCATS GRDRSM Program contains only the de-identified data of the rare diseases patients, but the contact information is present only in the regional or national registry (home registry) made for the particular rare disease that contributed to GRDR program (9). The increasing complexities of EHRs enable eligible patients to be enrolled in clinical trials. The recent acquisition of Covance by LabCorp facilitated the accessing of diagnostic data from 75 million patients (11). This data can now be used to recruit patients in the region by applying screening criteria of the study and contacting the relevant rare diseases patients to participate in clinical trials. According to a study by the Journal of the American Medical Informatics Association, clinical trial alerts (CTAs) generated by the EHRs aid in prospective clinical trial patient recruitment (12). Social media, online patient communities, and mobile technologies are other cutting-edge e-recruitment tools used now (Figure 6). In 2013, Boehringer Ingelheim partnered with one of these online patient communities, PatientsLikeMe, to learn the real-time experiences of Idiopathic Pulmonary Fibrosis patients and to support advancing research (13). Synergistically using home patient support, patient registries, and e-recruitment patient tools in a clinical trial can easily hasten patient recruitment in the challenging rare disease space to meet enrolment timelines. Therefore, prevention of clinical trial delays can hugely impact the time of the drug reaching the shelf and benefitting the rare disease patient. Sponsors and CROs should work collaboratively to include these nuances in their clinical trial protocol design to foster recruitment and, most importantly, retention in rare disease trials. 10) Impact Report, Tufts Center for the Study of Drug Development, Vol. 15, No. 1, Tufts University, 2013. Samiya Luthfia Khaleel, Senior Research Analyst, Beroe Inc, India, started her career as a Drug Discovery Scientist, enabling her to connect science and procurement in pharmaceutical R&D. Her career involves regular interaction and networking with 100+ suppliers in clinical categories, keeping track of all the innovations in the market related to the procurement of R&D services. She completed her Masters in Biomedical Sciences from Aston University, completing her thesis on asthma and COPD treatments. She is also an engineer with a background in Industrial Biotechnology and has experience conducting research on generating electricity from tannery waste water.